This aviation website, containing information, stories and photos of historic airframes, has been revamped, the idea being to feature even more classic & vintage aircraft material, both civilian and military, preserved or 'in period'. Pilots, spotters, preservationists and armchair aviation enthusiasts all welcome! Already featured are many vintage aircraft photographs, some dating to the war, others taken in the 1950s and 1960s at airfields and airshows around the country. Some wartime piston-engined aircraft, now revered amongst the aviation community, are shown in the early 1950s when their value was minimal, and were destined for the chop, or to see out their days on a fire dump somewhere. Moving into the jet age, there are some super photographs of aircraft such as the B1 and B2 Avro Vulcan, the prototype Concorde in action, the delta-winged Gloster Javelin, the groundbreaking Meteor, the Valiant, Super Sabres, and even an under-wing view of the Tupolev TU144. The classic aircraft photographs shown on the right are just a taster for the type of images that are on the site already, and will be added in as time allows. Needless to say, if you have anything that you think may be of interest, by all means drop me an email. Photos of aircraft either civilian or military would be much appreciated! I've been interested in aviation from a young age. Back in the 1970s I'd be a regular up at Manchester Airport (Ringway), or at local airshows (Barton & Woodford), eagerly watching the aircraft doing their flybys. Sadly airshows at both these airfields are no more, although a white RAF B2 Vulcan can still be spied at the Woodford airfield (where it was built by Avro in the 50s) from a distance away. Manchester Airport has expanded considerably since the early days, when you could still spectate from Piers A and B at classic civvy jets such as the Boeing 707 (eg British Airtours, British Midland), 727 (Dan Air), Douglas DC8, HS 121 Trident (BA), BAC 1-11(BA, British Caledonian etc) and even the occasional rarity, such as the Convair Coronado, and the Heavylift CL-44 cargo plane. In those days 747s were not a common sight, so diversion days, when London was fogbound, caused great excitement amongst pencil-wielding spotters, as many many heavies from previously unseen airlines would stop over at Manchester. The plan with Classic Aircraft is to feature the older aeroplanes no longer in regular use, both civilian and military. I hope you find something of interest within these pages! In addition to period photos featuring classic and vintage aircraft, there is also a comprehensive gallery of recent images, featuring older aircraft that have survived into preservation. These later pictures can be seen here. Running for some time now has been an extensive aviation classifieds section, free to use, and hopefully of use to anyone interested in old aircraft, or perhaps visitors who collect memorabilia relating to a particular airframe, or may be involved in the restoration of vintage aeroplanes and are looking to find parts. Ads are placed daily, so it is well worth a look if you have something to sell, or need to find a rare part for yourself. I've long been a fan of the supersonic Concorde, and I was gutted when British Airways and Air France announced it's premature retirement. I've some original Concorde memorabilia dating to the 60s and 70s that I hope to feature here sometime, and in the meanwhile there is a free-to-download Concorder screensaver available, featuring G-BOAC, if you too are a fan of this wonderful aircraft. It was a great privilege to view the Avro Vulcan XH558 make its arrival at Bruntingthorpe airfield in 2011, to join - for two days only - many of its former cold-war compatriots. Many classic jets were destined to perform high-speed ground runs at Cold War Jets, largest of which to join the Vulcan was of course the mighty Handley Page Victor K.2, a resident at this airfield maintained in live condition. Photographs from this gathering can be found on the Cold War Jets page. Photographs of the residents at Bruntingthorpe airfield prior to the Cold War Jets running day, and the arrival of Vulcan XH558 to join former cold-war colleague the H.P. Victor, can be seen here. 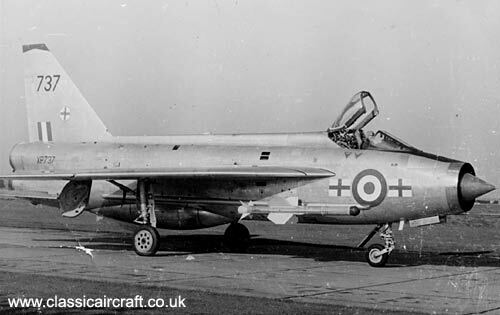 BAC Lightning, just one of many photos featuring RAF jets sent over by Alan Lane, that will feature on this site shortly. 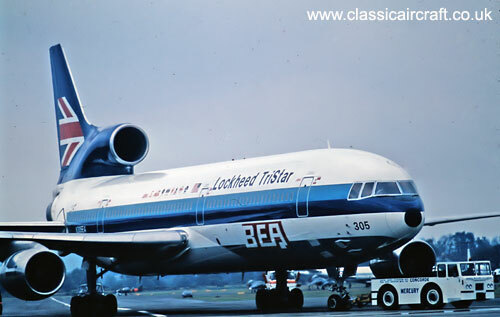 Many original photos from Dave Trutzenbach already feature, and more, like this BEA-liveried Tristar, will be added soon. Eric sent me some early aircraft photographs a while back, such as this shot of Qantas DC4 VH-EBL. 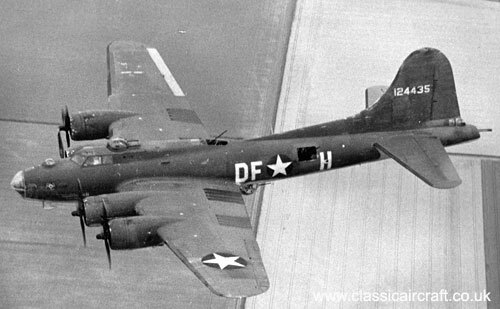 Alan sent me some original photographs taken by his father, including this one of a B-17 Flying Fortress. More to be added soon. What's new at Classic Aircraft. As new items are added to the site, they'll now receive a mention here. New Classic Vickers VC10 C Mk.1 in service with RAF Transport Command during the 1960s. New Preview of Cold War Jets at Bruntingthorpe aerodrome. Rare photographs of the prototype Miles Aerovan at an RAF airfield. 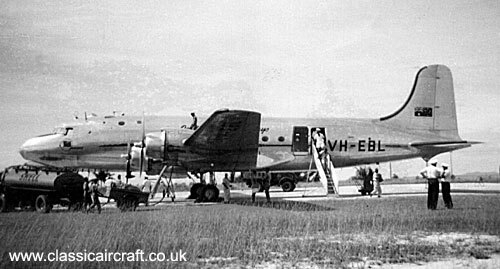 Practice air-drops in Borneo from the Blackburn Beverley of RAF Transport Command.